LU.PA Italian Jewelry Design - Beautiful, fun, and good for you! Saturday November 26th, the day after Black Friday, was the second annual Small Business Saturday. It was the day dedicated to American People to rebuild Business made in America by shopping with small businesses that make our communities special. To support this movement, starting Saturday November 26th and throughout the end of the year, I offer 10% discount on any purchase of LUPA Jewelry made on site or through the Internet. I am doing my best. I hope you will join me! Buy in America, made in America by people in America! As many of you know, I am a small business owner and my business is founded, based and operates in America. I started a couple of years ago and I work to please you with my artistic jewelry creations. Many of you appreciate my work and I greatly thank you for it. Being a small business, I constantly strive to compete with big commercial chain stores, which can sell a product for a minimal amount of money where quantity is the key or, when high quality goods are sold, they profit greatly. These big businesses can afford to hire manufacturing force at low cost, unfortunately often because the workforce is out of the United States, where costs are lower than here, hence the final production cost is much lower than if it was made in here. This is fine when the World’s Economy is not disintegrating; in these times though, we need our country strong. Competing with big companies that have their work outsourced is a huge problem for a small business and neither brings money in to or keeps money in our country, where we need it. Again, I am doing my best. My main source of the metals I use is from the US. Recently, I added an employee to my small business and in doing so I added a job to the country and I am happy and proud of it! Have very Happy Holidays and Thank you for your business! I work with my heart. Then – voila’! A new piece is born." 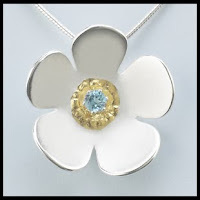 Fine Art Jewelry, designed by a European mind, hand made in America. Award winner in Jewelry Design and Fabrication, Lucia Pasquinelli (LUPA) creates unique jewelry with distinctive eternal European style. Born and raised in Rome, Italy, Lucia has always been surrounded by art, history, and tradition. Her jewelry reflects her passion for culture, nature, and innovation. Her training includes bench work with a professional jeweler in Rome as well as with master craftsmen in California. LUPA Jewelry is handcrafted exclusively of precious metals and may include gems, and pearls. Stones, along with few findings and Italian sterling silver chains, are carefully hand selected to assure quality and the pleasure of wearing a one of a kind ornament. Our metal is sustainable and it comes from New Mexico, a small manufacturer in Los Angeles, and our studio in Los Angeles, where scrap is recycled.